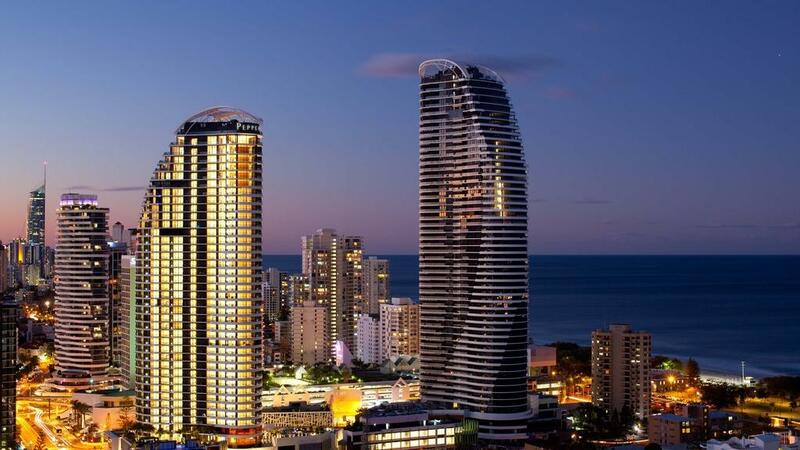 Peppers Broadbeach offers a great location not far from the famous Gold Coast beaches, plus an array of restaurants, bars, cafes, large shopping complexes and much more. The Gold Coast Airport is a 25 minute drive south and Brisbane is located just over an hour north of this Gold Coast accommodation. 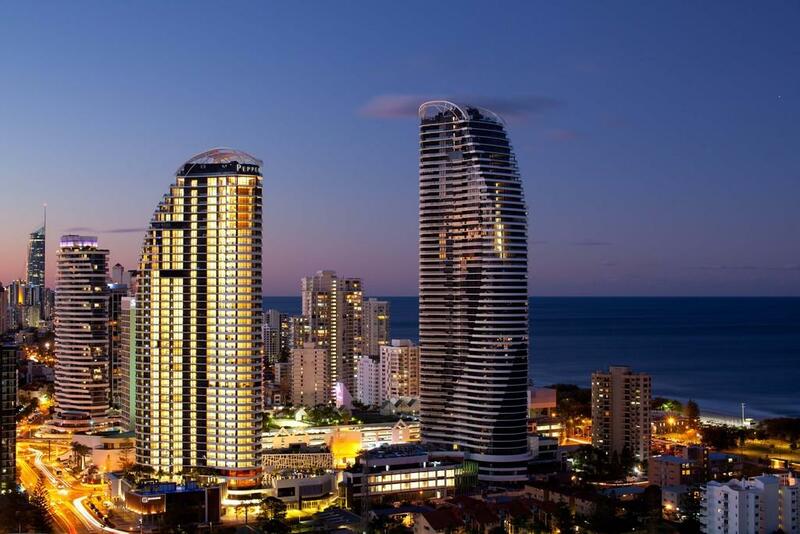 Escape to the Gold Coast and stay in style at Peppers Broadbeach. This stunning Gold Coast accommodation offers guests a choice of 1, 2 and 3 bedroom suites located within two towers that boast panoramic views of the Gold Coast Hinterland and Pacific Ocean. All suites feature full gourmet kitchens and facilities such as a pillow menu, complimentary iPad use and complimentary in-room WiFi. Relax in the Zen gardens and tai chi lawns, or watch a movie in the private cinema. Prepare your own meal on the teppanyaki barbecues, take a dip in one of the 3 pools, or work out in the gymnasium before soothing your muscles in the steam rooms and saunas. A short stroll will have you on the doorstep of a wide choice of alfresco international cuisine restaurants and bars. Peppers Broadbeach is the perfect place to base yourself to explore all that is on offer on your next family holiday or romantic escape to the Gold Coast. Peppers Broadbeach offers well appointed luxury suites overlooking the ocean or Gold Coast hinterland. 1 Bedroom Suite: Bedding is 1 King Bed OR 2 Single Beds. Maximum room capacity is 3 Adults & Children. 1 Bedroom Ocean Suite: Bedding is 1 King Bed OR 2 Single Beds. Maximum room capacity is 3 Adults & Children. 2 Bedroom Suite: Bedding is 2 King Bed OR 1 King Bed + 2 Single Beds. Maximum room capacity is 5 Adults & Children. 2 Bedroom Ocean Suite: Bedding is 2 King Beds OR 1 King Bed + 2 Single Beds. Maximum room capacity is 5 Adults & Children. 2 Bedroom Premium Ocean Suite: Located in Tower One on a high floor, these suites have a large private balcony and stunning views out to the Pacific Ocean. Bedding is 2 King Beds OR 1 King Bed + 2 Single Beds. Maximum room capacity is 5 Adults & Children. 3 Bedroom Sky Home: Bedding is 3 King Beds OR 1 King Bed + 4 Single Beds. Maximum room capacity is 7 Adults & Children. Broadbeach boasts many of the Gold Coast's award-winning establishments and the alfresco style setting provides a vibrant and colourful atmosphere. You will find an amazing choice of culinary delights just steps away from the front door of Peppers Broadbeach. A number of local restaurants offer a charge back facility (please check with hotel reception). Alternatively take advantage of the gourmet kitchen in your suite to cook up a storm yourself.